How many dinosaurs are there in the dinosaur band? Count the dinosaurs as each music section gets up on stage to play their fabulous instruments, from guitars to flutes to piano! 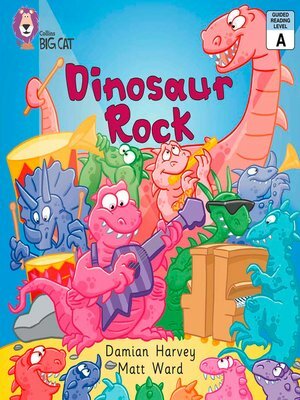 The dinosaurs build up slowly into a huge band and begin to rock! â?¢ Pink A/Band 1A books offer emergent readers very simple text supported by illustrations. â?¢ Text type - A story with predictable structure and patterned language â?¢ A final story map spread shows all the dinosaur rockers, encouraging children to recap the story. Damian Harvey has worked as a hospital radio presenter, painter-decorator, and swimming instructor, as well as writing several books for children. He lives in Blackpool, Lancashire.